The L Now Pro Indoor Cycling Commercial Standard Bike C580 is also known as the L Now ‘’Pooboo’’ and that could be seen imprinted on the mainframe and the seat of the bike. 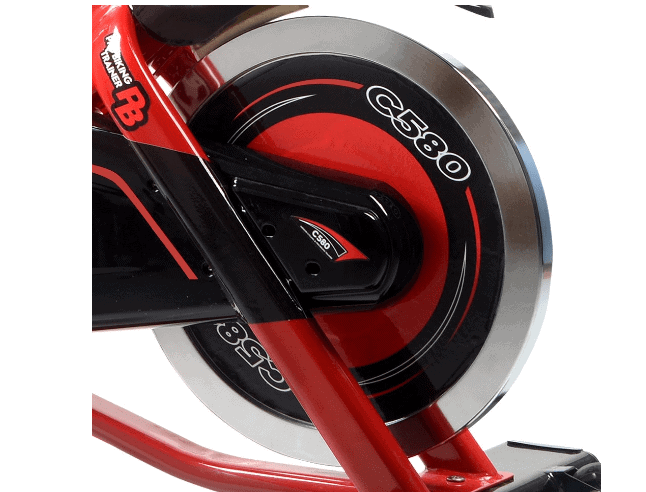 L Now is a brand that is currently making a mark in the fitness industry by consistently manufacturing innovative indoor fitness equipment that adds value to one’s life, and the L Now Pro Indoor Cycling Commercial Standard Bike C580 is no different, thus, could be listed in the best spinning bikes catalog. It’s a good looking bike that has this commercial construction that allows the user to workout hard and frequently without the fear that anything could go wrong with the bike while exercising. It is not a foldable bike but its size is going to be admired by those that have a space problem. It supports 280 pounds/127 kg maximum user weight capacity and features a 40-pound heavy duty perimeter weighted flywheel that ensures a consistent momentum and smooth ride. It is also quiet during operation, thanks to the belt drive system. Both the seat and the handlebar are adjustable, the pedals feature toe cages with adjustable straps that ensure that the feet are in place and secure. Click right here to have a peek at the discounted price of the L Now Pro Indoor Cycling Commercial Standard Bike C580 on Amazon. As the name implies, the L Now Pro Indoor Cycling Commercial Standard Bike C580 has a commercial grade construction that is, however, to be used at home. The frame is made of solid steel and neatly welded to be sturdy. It is sprayed with anti-corrosive and scratch paint that makes it look elegant and also prevents rusts and indiscriminate scratches. As aforementioned, it supports 280 pounds/127 kg maximum user weight capacity. The seat is 4-way adjustable while the handlebar is 2-way adjustable, combined to provide adjustability that accommodates users of different heights and sizes. The bike has a solid base framework that features thick flat stabilizer bar at the front and the rear bases which also have rubber adjustable levelers that grip onto the floor and also enable the user to balance the bike on a surface that is not even. The bike’s overall stability is further enhanced by its weight (103.6 pounds/47 kg) and its integrated transport wheels at the front base make it portable and easy to be relocated regardless of its weight. Most users who purchased the bike also purchased a protective rubber mat that prevents the spillage of sweat to the floor and also guarantees superlative stability. The L Now Pro Indoor Cycling Commercial Standard Bike C580 has a typical indoor stationary bike size that does not take up much space. The overall assembled dimensions are 49 inches long by 20 inches wide by 41 inches tall. Differently put, the stationary bike will require a workout area of 4’ long by 1’7’’ wide and a ceiling height of at least 7 feet high. Additional extra clearance of 1-2 feet will be required at the rear and on each side of the bike for safety and convenience purposes. The bike is very likely to be used in many areas such as in the living room in front of a TV or even on the balcony or at the garage. The seat is 4-way adjustable; it could be adjusted vertically (upward/downward) and horizontally (fore/aft). This gives users of different heights the opportunity to use the bike comfortably and multiple users could also use it in a family thereby eliminating the need to purchase different bikes for each person. Users between the heights of 5’-6’ will be accommodated without restrictions as to whether they can exercise with full leg extension. The bike could also accommodate individuals that are few inches taller but there might be some level of campiness depending on how tall the person is. Shorter users with a minimum inseam of 25 inches will be good with the bike. The seat is ergonomically designed and soft to provide decent comfort that could allow the user to train longer. The saddle’s comfort could be enhanced by using a gel seat cover and it is also possible to replace it completely with another saddle of your preference. Nevertheless, users do not think that the seat has any major flaw. The handlebar is 2-way adjustable; it could be adjusted upward and downward which certainly compliments the bike’s overall adjustability. The handlebar post just as the seat post has distinct adjustment markings that make adjustments pretty easy and unforgettable. It features a multi-grip design that allows users to have options for different workout grips. The handlebar is coated with a soft rubber foam material that provides a comfortable and secure grip that prevents slippage and blisters in the palms. EKG sensors are also embedded in the handlebar so that the pulse rate data could be transmitted to the monitor each time a user grips them while working out. The pedals’ crank arms are made of aluminum alloy and could support standing ride of a person that does not weigh more than 280 pounds/127 kg. They (pedals) feature toe cages with adjustable straps. These ensure that the feet are in place and secure and could accommodate standard gym shoes only. However, if you wish to use spin shoes, you can swap them for SPD clips because they have standard threads, even bicycle pedals can fit in. The L Now Pro Indoor Cycling Commercial Standard Bike C580 has a belt drive system that comprises a belt, pulleys, solid crank arms, crankset, and the flywheel. This type of drive provides a smooth and quiet operation that allows the user to exercise at any time of the day without the fear that the family members or the neighbors could be disturbed. The user could also enjoy watching the TV or listening to good music without having to raise the volume so high than usual. Moreover, the drive system on the bike is maintenance free. It literally does not require any type of maintenance. No lubrication or adjustments required. That said, the bike does not mimic the operation of a real road bicycle just like a chain-driven indoor bike could. The drive is bidirectional; a user could pedal in reverse as well so that more muscle groups could be exercised but this also means that a user cannot coast on it because the flywheel is fixed. For this reason, it is important to apply the emergency brake (by pressing the red tension knob down) each time you wish to stop pedaling. The L Now Pro Indoor Cycling Commercial Standard Bike C580 is integrated with a friction resistance system. This resistance system consists of a top-down brake pad, the tension knob, and the flywheel. These elements are designed and connected together to provide you with better riding experience. This is suitable for users at every fitness level; great for beginners, medium and advanced users and even for the elderly and those that are recovering from an injury. That said, the brake pad wears out over time and will require a replacement. Sometime there might a squealing sound when the resistance is engaged. When it does, simply apply little silicon based oil on the top edge of the flywheel to stop the sound. The resistance could simply and easily be increased by turning the tension knob clockwise and anticlockwise to decrease it. 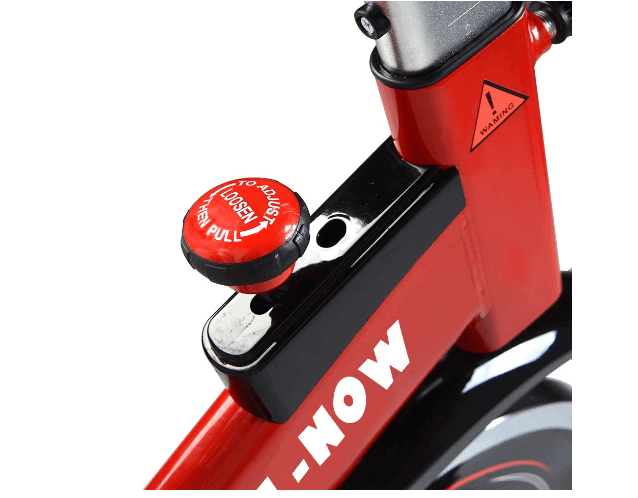 There are no pre-defined resistance levels indicated on the tension knob which is common with every bike that has a friction resistance system. Therefore, you just have to turn the tension knob clockwise or counterclockwise until you feel you have found the suitable resistance level for your workout. The only problem is you may not be able to keep track of your strength and endurance progress since there are no specified resistance levels to make comparisons with. The console attached to this bike is basic yet features a useful LCD monitor that keeps tracks of your workout data. This motivates and inspires you to work out even more. The display has good readability but of course, could be compromised when viewed in a room that is not well-lit because it is not backlit. The LCD monitor records and displays time, speed, distance, calories burned, odometer, and heart rate if you grip the EKG sensors while exercising. The heart rate display allows you to maintain a target heart rate zone at all times. The display/monitor is powered by batteries and it could be turned ON/OFF by pressing the MODE button. It could also automatically turn ON when there is an activity on the bike and auto shuts down when the activity ceases for a few minutes in order to save the battery life. The L Now Pro Indoor Cycling Commercial Standard Bike C580 is equipped with a tablet holder where you can place a tablet device for taking calls or listening to music while exercising. Aside from that, it doesn’t have a water bottle holder. You may have to improvise to keep water within reach so that you can stay hydrated throughout the workout session, it is important. Better still, you can purchase a universal water bottle holder from Amazon. The storage of the L Now Pooboo Indoor Cycling Bike won’t take up too much space. As aforementioned, it has overall dimensions of 49 inches long by 20 inches wide and 41 inches tall. This means it will need a storage area of 4’ long by 1’7’’ wide. The approval rating of the L Now Pro Indoor Cycling Commercial Standard Bike C580 on Amazon simply shows that it is a very popular indoor stationary bike. At the time of this review, this bike has quite a number of Amazon customers’ reviews that recommend it. The L Now Pro Indoor Cycling Commercial Standard Bike C580 is shipped in a box that weighs 117 pounds/53 kg with dimensions of 41.3 x 9 x 35.8 inches. The shipping cost of this package depends on the retailer that is selling it to you. However, some vendors such as Amazon provides free shipping and delivers to you within days from the day order was placed. As aforementioned, the assembly of the L Now Pro Indoor Cycling Commercial Standard Bike C580 is not difficult as it comes partially assembled. All you need to do is to attach the seat and the handlebar posts, the seat, the handlebar, the pedals, the rear and front stabilizer bars, and the console to the frame or the core unit. Included in the package are the tools required for assembly and an instruction manual that guides you through the assembly process. However, you may choose to use the ‘’expert assembly’’’ service on Amazon if you don’t wish to get your hands dirty but that comes with an extra charge. Apparently, no major maintenance is needed on this bike because it is equipped with a belt drive system, although, the brake pad may require a replacement when it wears out, but that takes time. You need to always examine the bike before use for any loose or broken part in order to avoid an accident or further damage to the bike. Finally, ensure that the bike is always kept clean from dirt and sweat before and after use. The L Now Pro Indoor Cycling Commercial Standard Bike C580 is designed for home use. It is a sturdy bike that provides cardio exercises that burn tons of calories even as you enjoy a good riding experience.